While asking my first question to Paul Scheffer, the voice of the imam from the nearby minaret sounded. In several seconds other mosques all around Istanbul joined the choir. Could this be a little quieter and less annoying, the Dutchman asks rhetoricaly, visibly irritated by the loud sound. 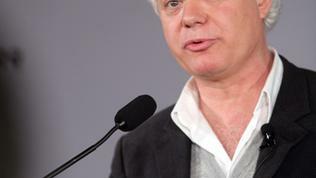 Although the professor of urban sociology at the University of Amsterdam is among the first to raise openly the problem with the immigrants in the light of public attention (in 2000 his essay “The multicultural drama” caused heated debates), he argues that the problem is not the Islamic religion. Rather the way it is practiced – intolerant towards the others, non-Muslims. euinside: The Dutch are very tolerant when it comes to prostitution or soft drugs, but why don’t they have this tolerance when it comes to immigrants? Paul Scheffer: Generally speaking, I think our tolerance became more and more indifference. We are not living with each other, but living next to each other. The idea was “As long as you don’t touch me, as long as you don’t interfere with my life, I’m not going to ask you any questions.” When we are living in a city like Amsterdam, where 17 nationalities are living together, are trying to live together, and where a half of the population is from immigrant families, then we can no longer ignore each other. In a certain moment it became clear where the limits of our tolerance were. Here comes the moment when we have to start asking questions to each other. This is my understanding of tolerance – not to ask questions, to say “Everybody lives his own life, we don’t interfere”, without mutual interference, without saying “How are we going to live together, what we are going to share, how are we going to feel a sense of responsibility for a city like Amsterdam?” But I could say the same about Marseilles, or Birmingham, or Malmo. And that is the moment when our tolerance has to be redefined: not being indifferent, but being far more active and engaged. That is, I think, what is going on in the Netherlands. There were many mistakes, many exaggerations, things that have been said but perhaps shouldn’t have been said, but we are trying to find a way of living together. In a society where 20% of the population are immigrant families, that will become in the next 20-30 years 30% of our population, it is a huge change. euinside: Is the Muslim religion the main problem? They have to redefine what it means to be a Muslim in a society with religious freedoms and where they are a minority with other religious minorities and they have to find a way to practice their religion in these different circumstances. But this is a mutual problem. Part of the Dutch society responds to Islam, saying it doesn’t belong here and a part of the Muslim community practices its religion, saying we don’t belong here - we are Muslims, we keep our distance to this liberal society, because if we become too much part of this society, our faith becomes corrupted, we are no longer true believers. So you see this avoidance of the both sides. euinside: In Bulgaria we have no immigrants but we have Roma. Is the situation the same? Paul Scheffer: No, because we have a very developed welfare state, all immigrants have access to social security. There are many, many immigrants who are dependent upon the social security system, which is very generous to everybody, so this sort of poverty which you would see in some countries in the Roma communities is definitely not the same. And therefore the rights of citizens – Muslims, like everybody else, have civil rights, so they can build mosques (there are 500 mosques in the Netherlands), Muslim schools or whatever. So I would say that social benefits, but also the civil rights, generally speaking, are much better in the migrant communities in a country like the Netherlands, than the stipulation of many Roma communities. euinside: Maybe the problem is how people understand citizenship and their responsibilities to the society? 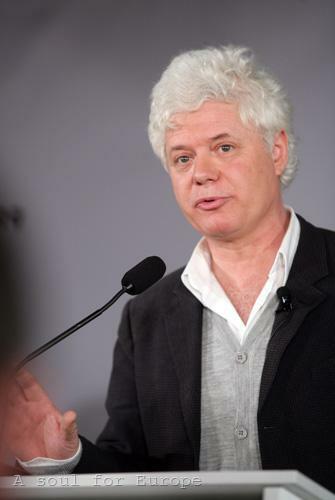 Paul Scheffer: In my view, the immigrants should be invited to see themselves as citizens. That means to do exactly what everybody else is doing - to be a schoolteacher, to work in a factory, to be a city chancellor, to be the mayor of Rotterdam - the mayor of the second city in the Netherlands is a first generation Moroccan immigrant! I expect them to feel the same sense of responsibility that I would expect of all the others. I would say to them: We have a common future, we are part of one city - Amsterdam, Berlin, Sofia or whatever - we are no strangers, we have responsibility here! Of course, this is more difficult for the first generation, but the children of immigrants' families, who are born in the Netherlands, went to school there, speak the language - they see themselves as part of this society or at least they have every possibility and should grab it. euinside: But in Bulgaria I see Bulgarians who don’t feel themselves as citizens of their own country. They don’t want to engage, don’t want to be active, so this is obviously not only a problem of immigrants. Paul Scheffer: That's exactly the most important question. Because we can learn something from the immigration problems. When the society says to the immigrants “You should see yourselves as citizens”, a question comes back: “What does it mean to be a citizen? And do you behave as citizens yourselves ? Or do you ask more of us, the immigrants, than you are willing to do yourself?” I think in many ways we have been doing that, we have been rediscovering many things. That is the meaning for me - reciprocity. You cannot ask a question to someone else if you are not willing to ask the same question to yourself. So, yes, you are completely right: there are many people, who too live with the idea “I live here, I take all the opportunities from this society, but I don’t feel any obligation, I don’t feel any responsibility”. But, I think it is part of the open society - not to engage. You cannot expect from everybody to participate and we shouldn’t see it too dramatic. Somebody who is helping organise a small football club is also doing something meaningful for the society. It shouldn’t be necessarily political or grandiose work, it may be something very simple and concrete for your neighbourhood. Helping your neighbours means already being active. There are many people that live for themselves and don’t care about the rest. You cannot force people to engage or to participate, but you can invite them. I think, what we have learned form the discussion about the immigration, is that we have to rethink the meaning of citizenship and to reaffirm it. Not only as something that you demand of newcomers, but also of people who were already there. So that is for me the great hope. euinside: So you are an optimist? Paul Scheffer: The real important lesson from the immigration history is that there are always 3 phases. The first is the avoidance, when the immigrants are keeping a distance from the society, which is not embracing them and is also keeping a distance. And this avoidance we call tolerance. euinside: It is hypocritical in many ways. Paul Scheffer: Yes, but it is also human. Then you see at a certain moment this avoidance breaks down, because you cannot avoid each other anymore, and then comes the phase of conflict. Quite often the people touch each other and it hurts, because you understand you have to rethink many traditions. This is difficult. Every time in the past when there was mass immigration – Italian, Polish people, Irish people immigrating to America, there was always a lot of conflict. And perhaps every major social change has also elements of conflict. I see the conflict as a sign of integration, as a sign of looking out for an answer to the question how are we going to live together. And sooner or later the conflict always evolves in new forms of accommodation and living together. I see this is happening now in Western Europe: we have the avoidance behind us and we are living in the period of conflict. But I am not pessimistic about it, because I haven’t found one example in the immigration history where the question of immigration divided the society in the long run. There is always a moment when the new generations find a new social compromise. So that’s why I am optimistic - not as a dreamer, but simply by looking at immigration history. Personally, I find little to be optimistic about Muslim immigration in Europe or anywhere else for that matter. No Islamic nation today tends to greater secularism; quite the contrary. And, even if Muslims in Europe became more 'tolerant' of others, what about a hundred years from now when they make up a majority of the population? What incentives will they have to be 'more like us', open, critical, secular? None. The ideology of Islam itself is the problem. Other religions have been 'tolerated' as long as it was convenient (and profitable) to do so; other religions have never been seen as legitimate by Muslims. As for secularists, they will have a very hard time once Europe is dominated by Islam, as will Science and all that we consider modern. No, I am not optimistic about Muslim integration into secular societies. It has not worked in any Muslim dominated society to date; so why would it work in the future? Can we be optimistic? It seems that if one were to compare histories (always a tenuous thing to do) of immigration in the USA and EU nations, there is little to be optimistic about. The one thing which allowed immigration to work in the long run in the USA (& let's not forget it was a long and bloody road) was that after each major tidal wave of immigrants a reactionary policy took hold (or downturn in economic conditions) which stopped those tidal waves of immigrants. Perhaps without intent, this allowed the immigrants, or maybe it's better to say their children and grand kids to assimilate. Had the tidal waves not been stoppped or controlled there would have been little reason for immigrants and offspring to adopt the new culture in which they found themselves. For a variety of reasons (ideologies which can't accept notions of national boundaries; "self-hatred" by native Europeans -a now increasingly difficult status to define- of their on cultures; lack of population growth among native Europeans & concomittant need for labor; a naive notion that if we just treat all with kindness, we'll get kindess in return; fear of accusations of racism; fear of repeat of past horrors e.g., Nazi culture etc), Europeans may no more be able to stop the dike from being over come than the proverbial Dutch boy and his finger.